I enjoyed a preview Tuesday at the Baltimore Museum of Art (BMA) of a splendid new exhibition. It’s entitled: “Off the Shelf: Modern & Contemporary Artists’ Books.” The program will run from March 12th-June 25, 2017. To say the BMA is excited about the program would be an understatement. The senior curator of Prints, Drawings & Photographs, Ms. Rena Hoisington, acted as our moderator. Her enthusiasm for the display of the “rarely shown” 130 artists books and prints from the BMA’s collections was apparent and deeply appreciated by this writer. Ms. Hoisington underscored that some of the featured artists in the program are legendary figures in their field of expertise, such as Pablo Picasso, Toulouse-Lautrec, Raoul Dufy, Jasper Johns, Wassily Kandinsky, Joan Miro, Dieter Roth, Pierre Bonnard, Kiki Smith, David Hockney, Ed Ruscha, Grace Hartigan, Barbara Kruger and Fernand Leger. A few of the notable collaborations in the exhibit are: Author Stephen King with Barbara Kruger; Francesco Clemente with text by Albert Salvinio; Joan Miro with text by Paul Eluard; and Raoul Duffy with the poetry of Guillaume Apollinaire. 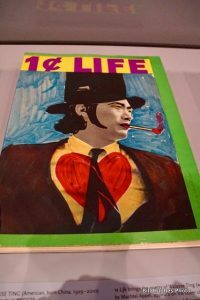 You will also find in the exhibition, Ms. Hoisington said, “more than 60 vibrant color lithographs” by the like of renowned artists/illustrators Jim Dine, Roy Lichtenstein and the man himself, from the suburb of Pittsburgh: one Andy Warhol. Their work is combined with the poetry of Walasse Ting. The exhibition was organized in collaboration with Johns Hopkins U. and through a grant from the Andrew W. Mellon Foundation. 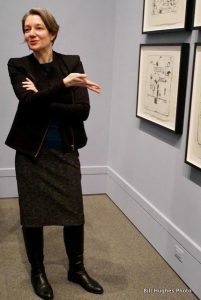 Let me sum up by quoting this ringing comment by Ms. Hoisington: “This exhibition is an extraordinary opportunity to see how giants of the literary, publishing, and visual arts world often combined their talents to create artwork that unfold page by page as text and image harmonize. To learn more, check out the exhibition website. Final word: The “Off the Shelf” exhibition at the BMA is a gem and highly recommended. To see more of my photos from this exhibition, go to my Facebook page.